Let me put in simple terms why we are apologising to the indigenous peoples. 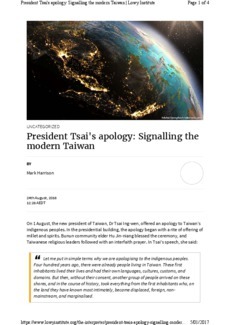 Four hundred years ago, there were already people living in Taiwan. These first inhabitants lived their lives and had their own languages, cultures, customs, and domains. But then, without their consent, another group of people arrived on these shores, and in the course of history, took everything from the first inhabitants who, on the land they have known most intimately, became displaced, foreign, non-mainstream, and marginalised.